The Japanese beetle (Popillia japonica Newman) is a highly destructive plant pest native to Japan as the name suggests. Natural predators in Japan keep populations in check. However it is rampant in the United States where infestations have been observed from Wisconsin in the north to southern Alabama to the eastern seaboard as far as Maine. Strict regulations and pest management strategies have prevented the establishment of the Japanese beetle in other parts of the country. They are about ½ inch long and are easily recognized by their iridescent metallic green body and copper colored outer wings. The adults feed on the foliage and fruits of several hundred species of plants and are a serious threat to American agriculture. If you see your lawn browning out in certain areas it is most likely that the grubs or larvae are developing in the soil and are feeding on the roots. 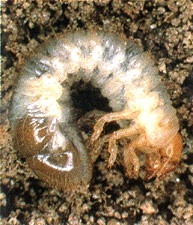 They can also be found under the turf of lawns in parks and golf courses as well as the roots of various other plants. Try lifting up a portion of your sod and you will see them merrily eating away. Turn the sod over a newspaper and count the number of white grubs visible. If the grub density is over 10 per square foot treatment will be required. If you like to go fishing you might want to collect some of them for bait. Otherwise you will have to try and get rid of them by chemical, biological and cultural methods that can be effectively used to manage these pests. However, you must consider the environment and refrain from using chemicals, biological or cultural substances that might kill off potentially beneficial organisms in the area. It would be like using a broad spectrum antibiotic to cure a common cold and kill everything else along with the cold virus when something less aggressive would suffice. Eliminating the pest can cause disruptions in the food web of an ecosystem and can seriously damage it. The risks and benefits of the pesticide must be determined prior to using it. Correct timing and application are also essential for successful control. It is important to read and follow the directions and safety precautions when using chemicals. However the use of these chemicals is not encouraged due to the potential environmental threat they pose. If your lawn or garden seems to be badly infested you can obtain a rough estimate of the Japanese beetle population by using mechanical traps for capturing the adult beetles. Japanese beetle traps consist of a pair of crossed planks fitted with a clear plastic bag placed under the junction of the planks and baited with floral scent, pheromone, (a chemical compound, produced and secreted by an animal that influences the behavior and development of other members of the same species) or both. They a re clumsy fliers and fall into the bag when they hit the planks. However, studies done at the University of Kentucky suggest that the traps attract more beetles than they actually trap. They damage plants by skeletonizing the foliage consuming only the leaf material between the veins. Another, perhaps safer control would be to employ biological means by using agents such as parasites, nematodes (tiny worms) and fungi can be used to control Japanese beetle populations. Some of these control agents are commercially available, and though they take longer to produce the same results as insecticides, biological control agents last longer in the environment and have no adverse effect on the environment. Diseased and malnourished plants are susceptible to attack by beetles. Therefore plants and crops should be kept healthy. Also prematurely ripened fruit should be picked off plants as the odor tends to attract Japanese beetles. This includes planting resistant plant species and removing the more susceptible ones. Homeowners and cultivators should have a well dispersed variety of plants that favor beetle resistant plant species in order to reduce the level of damage. Precaution should be taken if they are captured. Stepping on them or other wise crushing them could result in producing a most offensive odor that is not easily quelled. 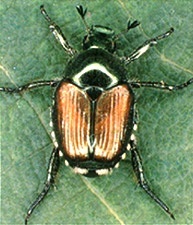 Although these control techniques and procedures will not completely eliminate the Japanese beetle they will help to keep populations under control and minimize the damage they inflict. In certain areas of the country where the infestation is abundant people should also be aware of the pest control methods they use and of the costs and risks associated with them. In some states or counties community efforts such as cooperative pest management programs can go a long way in suppressing Japanese beetle attacks.